When Sara Bollinger showed up at around 6 a.m. at the Patel Conservatory, she’d never performed a solo in front of an audience before. Yet she was about to perform live on television for the entire Tampa Bay area on the Good Day Tampa Bay morning show. The show, which featured our summer camp programs, aired in June. Since then, Sara’s artistic journey at the Conservatory has continued to blossom and reach new heights. 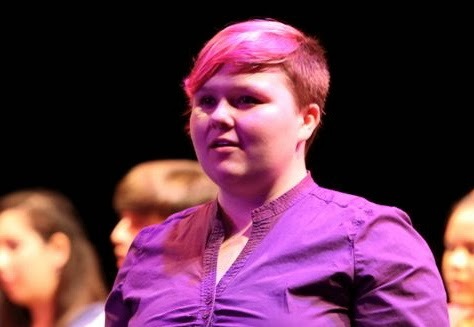 Sara joined the Patel Conservatory’s senior choir in January, 2012. The 17-year-old senior from Apollo Beach was pretty laid back and quiet at first. Prior to joining the Conservatory, she had participated in a musical theater group for home-school students. She also had taken three years of private piano lessons and five years of guitar lessons. But she was hesitant to try something new. She enjoyed choir and returned for the summer Vocal Arts Academy, where her talents really got her noticed. Since then, she has participated in a variety of classes including musical theater, private voice lessons and Rock Star Retreat, where Lynch discovered Sara's solo and keyboard skills and asked her to perform on Good Day Tampa Bay. Her first public solo performance was her rendition of Eminem and Rihanna’s Love the Way You Lie. “I enjoy making songs my own. I loved that song...it’s actually part of a giant mash-up of several songs that I put together,” she explained. Sara also put on a solo acoustic performance for more than 100 people at the Conservatory’s open house in August. While she always envisioned becoming a solo artist, Sara recently developed a passion for technical theater during the Conservatory’s summer production of Little Shop of Horrors. There was a call for volunteers to help put the set together and Sara, who was part of the cast, showed up. “I just had a blast,” she said. Now, in addition to taking several classes towards a Theater Certification at the Conservatory, she is doing a technical theater internship with Hatrick Theater. She hopes to pursue technical theater in college. Her time here has helped her develop her vocal technique, deepen her music theory and music reading skills and learn new skills. But, more than that, she has enjoyed the sense of community here. Check out Sara in our fall Vocal and Instrumental Music Fall Concert on Oct. 22, 2013. Tickets start at just $10. She is fabulous! And I can say I know her!! Quest for the Stars, a musical for kids!